schedule with the CustomQ feature. to grow at a CAGR of over 30% through 2021.
dashboard will be rolled out before the end of the year. and manage their presence across multiple locations using Zoho Social. it simultaneously to all the channels. across all touch points—marketing, sales, and support. available in special plans for agencies starting from $1000 per annum. 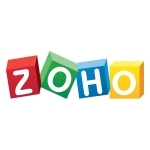 Zoho Social is also included in Zoho One. integrated suite of applications for the entire business. (Japan), and Beijing (China). For more information, please visit www.zoho.com.